Home to the Earth Rangers Animal Ambassadors and staff, the Earth Rangers Centre is a showcase of cutting edge building technologies such as energy metering, smart automation and controls, innovative water and wastewater management, solar generation, green roofs, and geothermal heating and cooling. 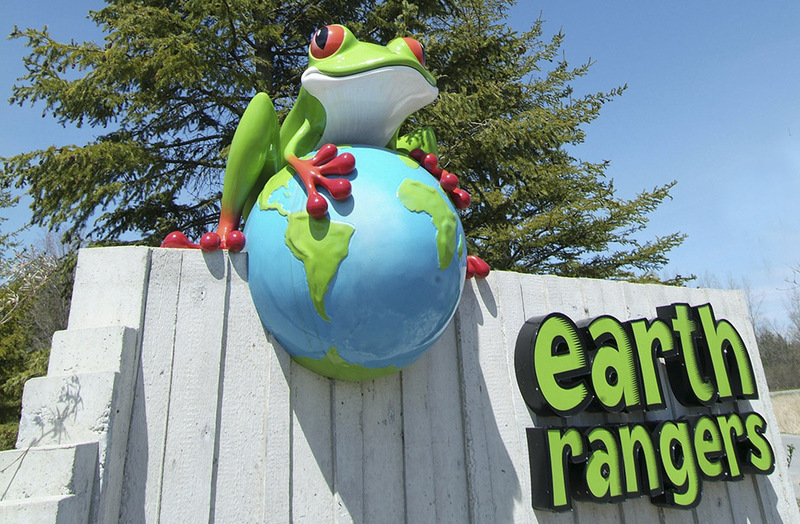 The Earth Rangers Centre is an advanced green building, certified Gold under LEED for New Construction. Ventilation: The Earth Rangers Centre was one of the first buildings in Canada to use displacement ventilation. Displacement ventilation is an air distribution system that circulates air through diffusers located near the floor level and displaces, or moves, the existing air into return ducts near the ceiling. Heating & Cooling: The Earth Rangers Centre was one of the first 100 per cent radiant heated and cooled buildings in North America. This feat was accomplished using 22 kilometers of radiant tubing, which was laid within the concrete floors and ceiling. Solar Electricity: The Earth Rangers Centre has two Solar Photovoltaic (PV) arrays in operation, both intended to help Earth Rangers further reduce its dependence on electricity from the grid. One of the most visible features of the Earth Rangers Centre parking lot is the new 57.6kWp dual-axis tracking array.